However with no proper dry running (aside from the latter stages of the race, which wasn’t exactly bone dry) it would have been difficult to evaluate the these components, so expect those who brought developments to fully utilise any dry running in Mexico this weekend. Fernando Alonso ran Honda’s revised power unit in full for the first time round the Circuit of the Americas, which boasts a new sound as well as additional performance. Whilst the exact laptime improvement is still unknown thanks to the wet weather, it is thought to be just over a tenth of a second per lap over the previous specification that Jenson Button was using. 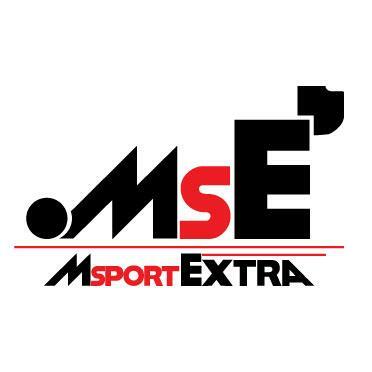 The new sound is a lot cleaner, with barely any ‘cutting’ tones at low speed that we have become accustomed to. This shows that – alongside the token spend that further improves the ICE part of the powertrain – Honda have also looked at software tweaks to help driveability and fuel efficiency, the latter being one of the power unit’s weak points this year. On the chassis side, McLaren also brought to the US another new front wing. Before Austin the wing’s fundamental concept had barely changed – numerous re-profiles and chopping and changing of the flaps, endplates and cascade winglets have been continuous across the year. However the new wing has now integrated the more aggressive out-sweeping design that is starting to filter through the grid, which was originally pioneered by Mercedes back in China. To push airflow further around the front tyre than before, McLaren have increased the width of the footplate to offset the leading element inwards (red line). The successive elements behind are staggered in an arc as they approach the back of the wing, turning the air at a greater angle. I have highlighted each element to make this more understandable. The first three elements have been also been extended into the footplate itself, creating three horizontal slot gaps. These have been made to control the vortex forming through the ‘tunnel’, which is now more distinguishable thanks to the ninety degree turn bend in each of the elements to meet the footplate beneath. Other modifications to the wing include a more rounded top flap at the outboard section, a higher reprofiled top flap (also highlighted) and repositioning of a couple of the flap supports to suit the new design. Towards the rear of the MP4-30 was a Ferrari-inspired floor design. The Scuderia introduced their unique multi-slotted design ahead of the rear tyre in Singapore, and McLaren have wasted no time copying it. 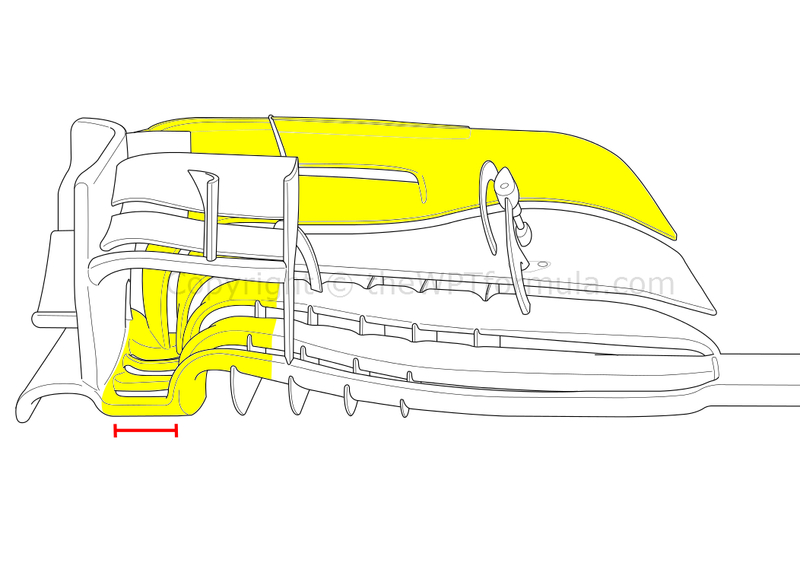 The section of floor contains 11 lipped slots (Ferrari’s only 8), ahead of the two L-shaped slots that they have used for much of the season. This combination of slots introducing airflow beneath the floor generates a powerful elongated vortex that is shed along the gap between the rear tyre sidewall and the floor. Sealing this area off using vortices has been a big aerodynamic hunting ground over the past few years as it improves the performance of the diffuser. Expect other teams to come up with a similar solution for 2016, as Ferrari have certainly seen significant improvements with it. Despite being well out of the championship hunt for some time, momentum is with the Maranello outfit as they head into the winter knowing that they are only a few steps away from conquering the almighty Mercedes. Keeping their development rate up at the back end of the season will help stretch their 2016 targets further, which almost forces them to find solutions over the Christmas break. However there were plenty of new bits and pieces that surprised us over the weekend. Ferrari are almost renowned for not being tempted to copy other teams’ work, instead finding their own solution to the problem. Under Marizio Arrivabeane, though, there is a change of attitude towards this, as the SF15-T was clad with parts which looked very similar to those found on the Mercedes. A pair of updated turning vanes have been installed underneath the chassis, directly below the lower wishbone pickup points. Gone are the outdated two element flicks and in their place a three element design connected by a curved footplate – identical to the Silver Arrows’ version. 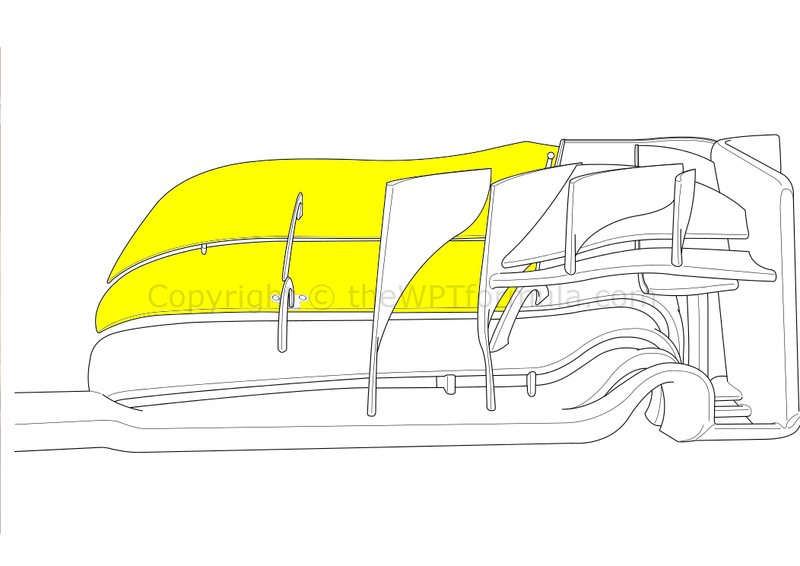 A ‘bat wing’ shaped horizontal turning vane has been formed around the ground speed sensor just behind the turning vanes, again not too dissimilar to that of the Mercedes. This vane generates thin vortices that manipulate the Y250 vortex shed from the front wing, helping in sending it around the sidepod undercut and sealing the splitter/floor. It’s surprising that it has taken Ferrari such a long time to tackle this area of the car, although could argue James Allison almost brought the team back to basics during the previous winter to get on top of their problems. Up front, a widely new front wing design made its way to qualifying and indeed the race, this being a 100% Ferrari product! It builds upon the front wing they have been slowly tweaking over the year – although it isn’t a major overhaul, it is certainly an evolution rather than a patch job. Starting with the outboard section, the vortex ‘tunnel’ is more prominent, the elements more arched and creating a clear divide between the outer and inner segments of the wing. 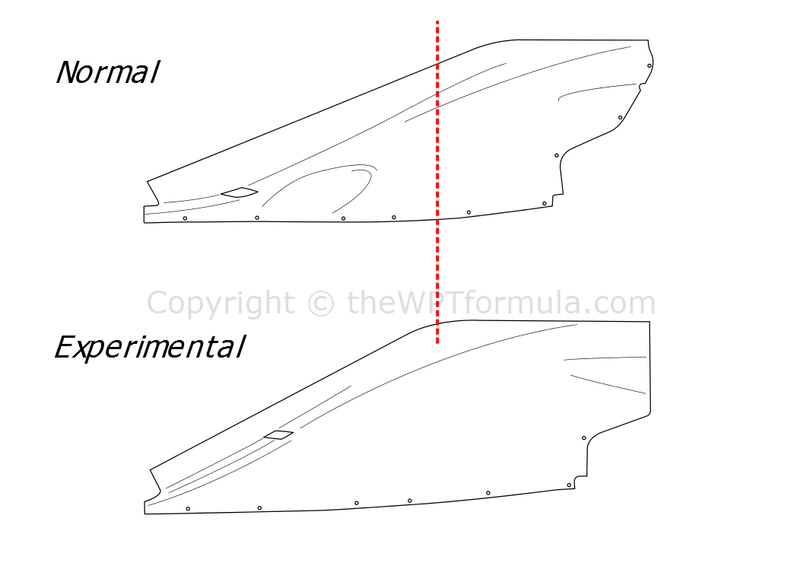 Like McLaren’s update, this is all to do with the formation of the vortex beneath the wing and how it is projected around the front tyre. The slot that once ran only half way across the span of the main plain now cuts all the way along to the neutral section of the wing, and the upper flaps have been rounded off. These changes are affiliated with the generation of the Y250 vortex along the side of the car, rather than downforce producing qualities from the wing itself. Other changes to the SF15-T include a pair of fences raised above the leading edge of the splitter, and the integration of the tiny winglets on the outer section of the rear diffuser with the Gurney flap arrangement that follows the periphery of the floor exit. With the Constructors’ championship sealed and the Drivers’ all but won, Mercedes’ recent developments in the US were aimed towards the final few rounds of the season and possibly some experimental work for 2016. Nico Rosberg’s W06 featured a pair of ‘ear’ inlets during FP1 on Friday, along with an extended engine cover and more open sidepod outlets around the rear suspension. In 2014, Mercedes utilised these inlets eitherside of the rollhoop to feed both the gearbox oil radiator and the ERS radiator, whilst the airbox was used to provide air for the turbo’s compressor. With the ERS cooler moved to the sidepods for 2015, and the airbox on the W06 split to provide both the gearbox oil cooler and compressor, it was unclear as to what the additional inlets were feeding. It transpires that they provide air to an auxiliary ERS radiator has been placed just beneath the gearbox oil cooler. Mercedes have suffered from overheating Control Electronics (CE) – an independent ECU for energy recovery system – in the past (Canada, 2014, for one example) and with high ambient temperatures predicted for Mexico at a high altitude, it is clear that the team do not want to take risks in this area. The extended engine cover has a notably hunched spine over the normal spec version, which is done to accommodate the additional plumbing for the ears and ensure better extraction of the internal heat built up by the extra radiator – hence the relocation of the small outlet holes along the cover’s spine.